How to cook protein to a particular doneness and maintain moisture is an essential technique to master. But first you need to understand what happens when you manipulate protein in order to control the process. Protein is made up of, among other things, 21 amino acids. These amino acids are grouped together in a variety of ways. Some are attracted to each other and some are not. It is the composition of and the attraction of these amino acids that affect the outcome of cooked proteins: meat, fish, poultry and eggs. 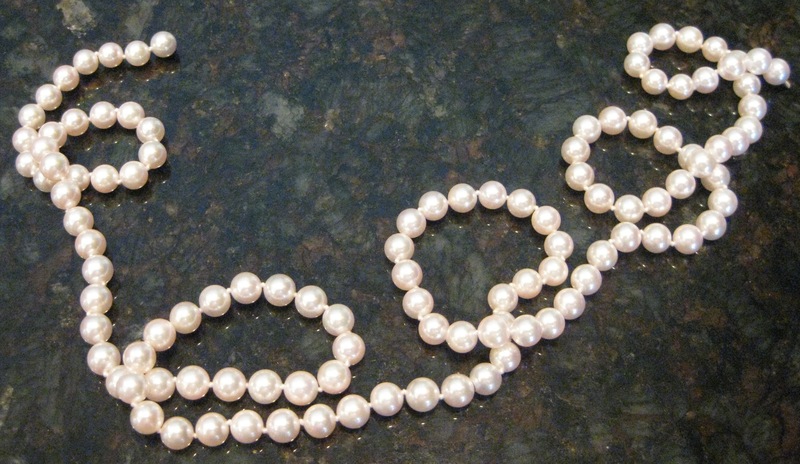 To demonstrate what happens to protein bonds, I’m using a beaded necklace in the photos. Each bead represents an amino acid. The bonds are looped together in a particular way when proteins are raw, whole, or never frozen. Keep in mind this is all microscopic and three-dimensional. Loops are formed by amino acids that are attracted to each other and held captive inside each loop is bound water; it cannot escape until something happens to loosen the grip, such as cutting, chopping, grinding, pounding, cooking, freezing, brining, or marinating. Water is bound to amino acids on the outside loops as well. This is the liquid that leaks out, which is why raw meat is moist on top and liquid pools on the bottom of the package. One of the ways we change protein at home is by cooking. Cooking changes texture, color, moisture, and appearance. It doesn’t matter what cooking method is used, the same thing happens each time, only the speed of the change will vary and that depends on temperature. Most cooking methods require high heat initially. We want to sear and create a crust or we want to stew and infuse flavor. But once high heat is achieved, temperature control is very important. Those bonds inside begin to change as a protein heats up. They denature or relax and unwind. Juices are free to escape, the appearance may change from translucent to opaque (egg whites), and texture firms. How much moisture you lose and how firm the meat becomes is dependent on temperature control and desired degree of doneness, rare, medium, well done. For rare to medium rare, the bonds will never completely unwind, preserving moisture and tenderness, with a lesser-cooked center; very rare meat is blue/red and has a cool center, medium rare has a pink-red warm center. Medium requires more cooking and a barely pink and hot center. It has less moisture and the meat is firmer – a result of the lost moisture and the tightening of protein bonds. Well done will have a completely colorless (grey/beige) hot center, very little moisture and is very firm and chewy. As a protein coagulates, begins to recoil, those loops reform binding water inside and out. How much heat, how quickly and how long that heat was applied affects the tightness of the reformed loops. This determines moistness and tenderness. All meat should sit off heat after cooking. The residual heat continues to cook the meat and protein bonds coagulate or reform. Cutting immediately releases those juices that would otherwise be bound within. In the rare to medium rare meat, the cooling time may only be a minute or two and most of the reaction occurs on the outer edges. Anything cooked to medium will have a higher residual heat and cook for 3-4 minutes more. The well-done piece continues to cook for up to 5 or more minutes, depending on size and density. Waiting before cutting allows the bonds to reform and retain whatever moisture is left within the meat. This process is called resting. Is it possible to have well-done meat and still have moisture? Yes. It requires proper temperature control. The initial high heat used to sear the outer crust can be lowered significantly to cook meat slowly for a longer time. This slows the unwinding process, but still allows the heat to penetrate throughout. If you continue to cook at high temperatures, the process of unwinding and reforming happens quickly; the resulting coagulation is very tight, which equals very little moisture and tough texture. A well-done piece of meat will never be as juicy as lesser-cooked meat, but with care, you can retain moisture. 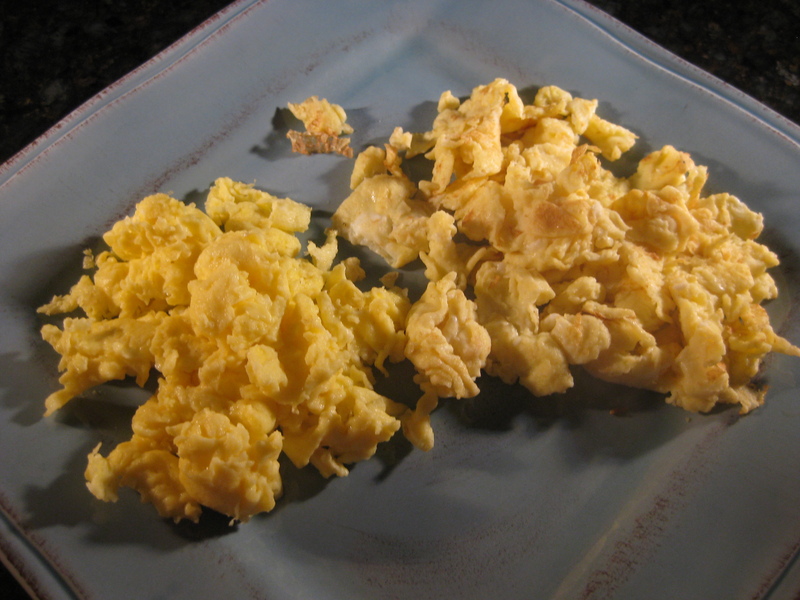 Below are pictures of cooked eggs. Two fried eggs and two scrambled eggs. For this demonstration, I cooked the eggs for the same amount of time, in a preheated pan, with a light spray of cooking oil. The only difference was the temperature used. 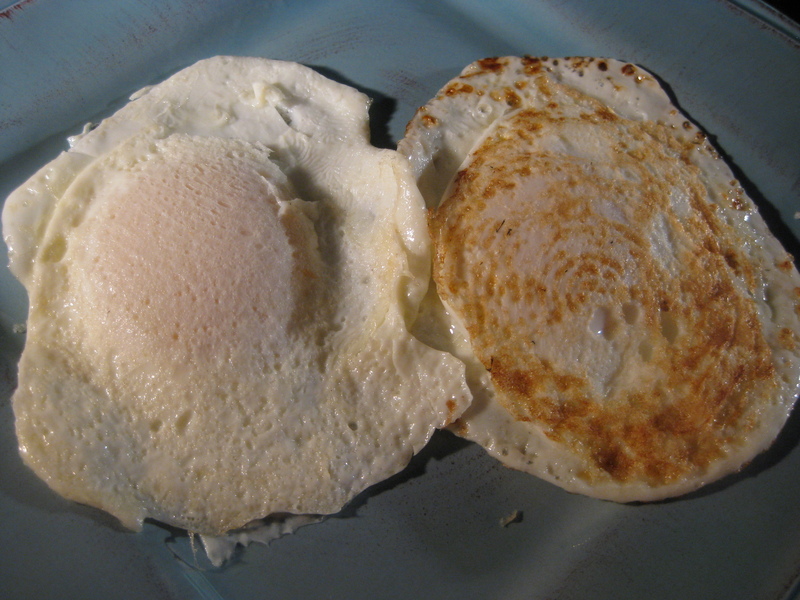 The eggs were both flipped at 2 minutes and removed from the pan after an additional minute. Notice the difference in color and texture. The one on the right was cooked on high. It has crispy edges (protein with no moisture left). I heard the water (egg whites are about 80% water) sizzling and the egg white jumped in the pan as the water instantly reached boiling point. 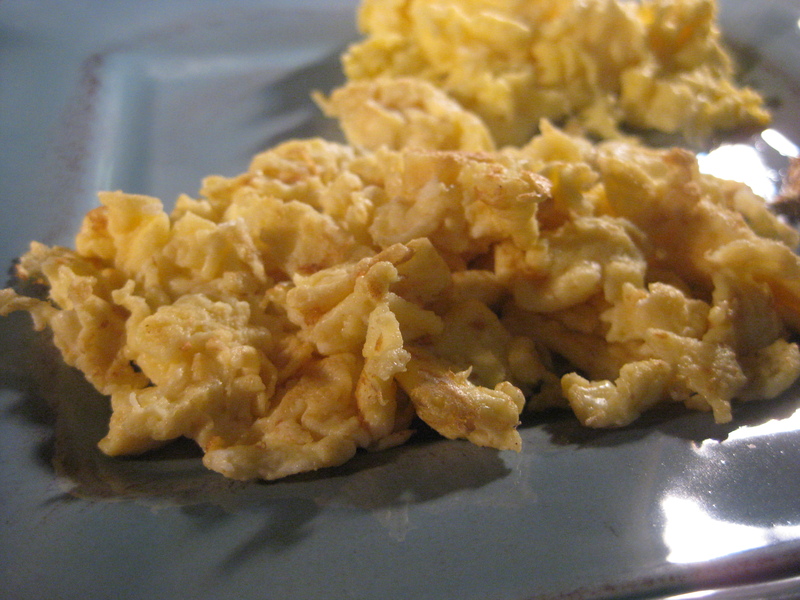 Thesescrambled eggs were each cooked for a minute and a half. The one pictured below, cooked over low heat, is plump and moist. 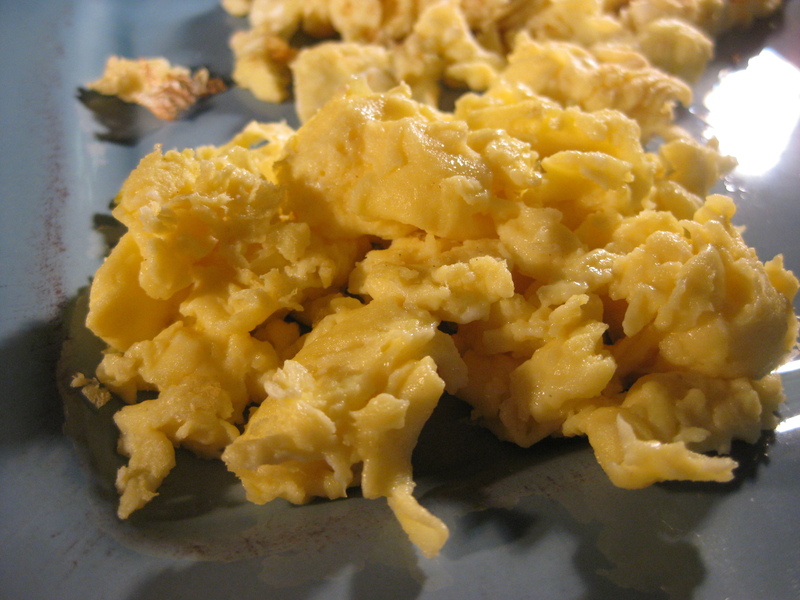 This egg, cooked over high heat, broke into pieces, has browned edges, and firmer texture and less moisture. For more information on how heat affects moisture and texture, see our post on how to cook meat.